I’m excited to announce that I will be a guest at next year’s Huntsville Comic Convention in Alabama. 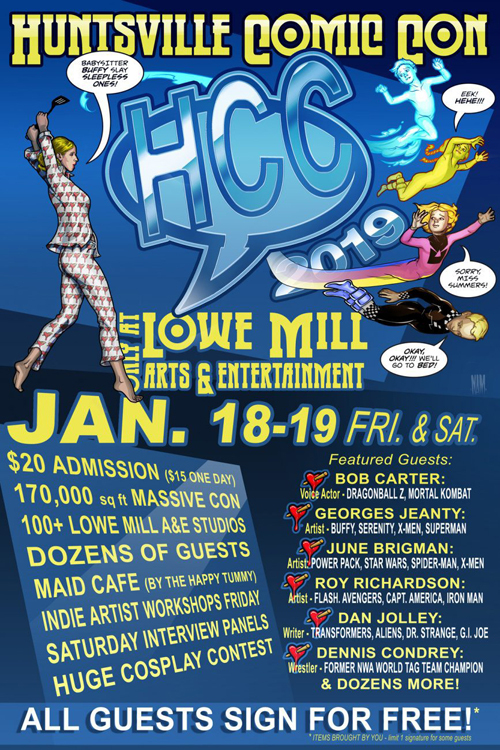 The convention is being held at Lowe Mill ARTS & Entertainment on January 18 & 19th 2019. In 2017 I was also a guest for its 1st year and now I return in 2019! However, unlike in 2017, I can only appear for one day at the Huntsville Comic Convention which is on Saturday (19th). Do not fret because I’m going to have all sorts of goodies available to purchase, the most important being Trophy Girls #1. This includes both the standard cover and the limited edition variant cover. I’m also doing something new with The Deciders series, and that is to sell dropcards. A dropcard lets you download all 5 issues with a special code located on the back of the card. I will be among some other fantastic guests at the 2019 Huntsville Comic Convention. For example, artist Georges Jeanty (Buffy, X-Men, Superman), voice actor Bob Carter (Dragonball Z, Mortal Kombat), writer Dan Jolly (Transformers, Aliens, G.I. Joe), and of course Nathan Massengill who is best known for his work on the first ongoing Deadpool series. It’s always difficult not to express my admiration for Nathan so I’ll just leave it at that. This year the 2019 Huntsville Comic Convention focuses on the “Indie” creators, makers, and performers. To honor them, they will feature “Workshop Friday” where you can spend time with those amazing guests in small workshops. Then Saturday be sure to stick around for the very popular Cosplay Contest. The 2017 Huntsville Comic Convention was exciting as well as an enormous learning experience for me. In other words you can expect much more preperation, product and presentation! I love talking about all things comics, sci-fi, and anime so please don’t be shy. I am a very approachable person. So, if you would like for me to autograph anything that isn’t at my table, I’ll also be happy to do so. I hope to see many of you there! And for those who need and address and/or directions please click here.